Sicario: The border is just another line to cross. Fig. 1 The threat is literally under the surface in the opening scene of Sicario. The film begins with a scene in the style of a psychological thriller. Macer leads a team of FBI agents on a raid on a gang safe house suspected in kidnapping and human trafficking. While sweeping the house, they discover, to their horror, corpses hidden behind the walls. With the house seemingly secured, Macer’s agents investigate an outdoor shed, triggering a bomb that kills two officers. In this opening scene, an emphasis is placed on the protagonist’s mental and physical vulnerability and paranoia arising from the palpable threat in and outside the house, a threat that is literally “under the surface” (the corpses behind the walls and the bomb in the shed). This threat is visualized by means of many tracking shots and zoom-ins on the faces of the living and the dead. In this sequence, we can see a reliance on spectator familiarity with established war film and drug war film conventions and how these expectations feed into the tension and paranoia through spatial control. Macer, an Iraq War veteran, is then recruited by Department of Defense specialist Matt Graver (Josh Brolin) to locate the Sonora Cartel members responsible. As Macer, Graver, and the mysterious specialist Alejandro (Benicio Del Toro) travel to El Paso to embark on this mission, a contrast between cityscapes, deserts, and border zones as transitional spaces is clearly felt: point-of-view shots from beneath the plane caress the tops of mountains along with the muted hum of the airplane, a presentation of a disturbed American frontier that fuels the film’s grim connection between both foreign and domestic combat theaters and the aesthetic strategies used to render them. Mark Kermode’s review of the film in The Guardian suggests that Sicario’s choice of audiovisual strategies was predictable when one considers a similar search for a rhetorical container by contemporary war films, starting in the early 2000s. “The blurred lines of America’s inglorious war with Mexico’s cross-border drug cartels are in danger of becoming a modern cinema cliché,” writes Kermode, describing the “drug war film” as an “already over-ploughed field” (Kermode 2015). This is a very curious comment when one contrasts it with Garrett Stewart’s statement in 2009 about contemporary war films: the “very programing of the genre may seem to have crashed – and in part from the electronic overload at the plot level itself” (Stewart 2009, 47). While Stewart may not have predicted the direction that Kathryn Bigelow would take the “overloaded” genre (and nor is Kermode dismissive of the direction Sicario takes the drug war film), both touch upon the role that surveillance has played in the shaping of the genres respectively. Though originating in the paranoia thrillers of the 1970s (most notably The Conversation, All the President’s Men, and Black Sunday), the rise of surveillance thrillers in the late 1990s and early 2000s (Enemy of the State, The Truman Show, and the Bourne series) informed the visual approach of twenty-first-century war films depicting contemporary combat theaters, in conjunction with the theories of Paul Virilio that war and cinematic technologies have developed alongside each other in a symbiotic relationship; as both technologies are centered on perception and movement, war “is a way of seeing” according to Virilio (Virilio 1989, 68). Taking his cue from Virilio (and in dialogue with Stewart), Joshua Gooch writes: “In this recent cycle of war films, surveillance combines the explicit threat of violence with an implicit reorganization of power and knowledge through the gaze” (Gooch 2014, 156). One could argue the same about Sicario and its precursor End of Watch providing an emerging language for drug war films, as they have followed a similar path; both contemporary war films and the new drug war film contain a paradox: societies that wage war through surveillance exhibit a strange “paranoia about the effectiveness of this power and control” (157). In this sense, they create and act upon what Timothy Melley calls agency panic, “the conviction that one’s actions are being controlled by someone else, that one has been ‘constructed’ by powerful external agents” (Melley 2000: 12). 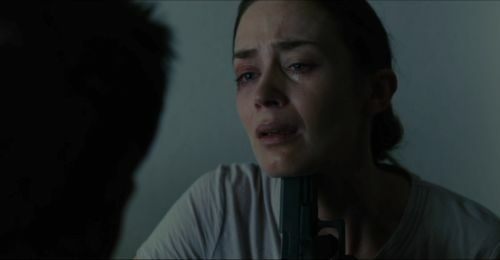 This paranoia is exemplified in Sicario, providing a more explicit relationship between war cinema, the drug war film, and the visibilities that both film types replicate. As a mode of affectivity, paranoia also redefines the relationship between film and spectator in that it not only “operates through the mechanical reproduction of images and sounds” (Deleuze 1986: 210), but because it is only realized as, and in the course of, cinematic experience.1 This article will explore the ways that the new drug war film, embodied in Sicario, has developed in conjunction with changes to the codes of war cinema, which, in turn, are essentially informed by the paranoid techno-aesthetics of modern warfare. Sicario’s audiovisual design accordingly relies on a certain “mapping impulse,” a cinematic articulation of space and territory that corresponds to the cartographic crisis of contemporary war films. What recent war films like Zero Dark Thirty and Good Kill in fact emphasize is that modern visual technologies used to scrutinize (and attack) potential battle zones do not guarantee complete control over these areas; rather, the visibilities produced by said technologies create new invisibilities and amplify a deeply paranoid sense of permanent threat and insecurity – a feeling that influences the actual sensuous navigation of the war zone, the experience of space in visual, acoustic, and emotional terms. This paranoia is nurtured by Sicario’s numerous bird’s-eye views defining a cinematic mode of foreboding: the film’s “semi-automatic colonies” unfold as a series of aerial shots charting Ciudad Juárez from its suburbs to its center, following the city’s motorways like veins that feed its heart the blood it desires. At the same time, the pounding soundtrack underlining this perspective frequently changes into an elegiac tone when accompanying images of the desert, contrasting the film’s paranoia with a profound melancholy. This war, so it seems, is already lost while still being fought, a sentiment contained in films about Iraq and Afghanistan. Sicario, we argue, conveys this sentiment through a set of audiovisual codes and narrative strategies that effectively blend some of the established conventions of previous drug war films with newly established genre codes of contemporary war films. This approach provides “the drug war genre” with a cinematic language suitable for critiquing the conflict in striking ways. Although having built on – and having partially developed alongside – the 1980s cop thriller (1988’s Colors, for example) and echoing the hard-boiled action of later crime dramas (End of Watch and Antoine Fuqua’s 2001 film Training Day), the drug war genre only now seems to have found its adequate representational codes in films about current military conflicts in the Middle East. The new drug war film stands in stark contrast to the drug war films of the 1980s and 1990s, films whose Columbian jungle action sequences resemble the combat sequences from Vietnam War films: Clear and Present Danger (1994) and Sniper (1993).2 Not only are the battle theaters of Afghanistan and Iraq quite similar to the Mexican desert, but the uncontrollable nature of these wars, the violence beneath the surface, and the blurred lines between allies and enemies bear striking resemblance to the operating modes of Pan-American drug networks. One might say that the latter could apply to any form of international drug trade, or to any modern war. Yet the aesthetic development of the Mexican drug war film marks another important shift in the evolution of genres and their mutual interferences. Mexico, which had long become an outpost of the American western due to the movement of the mythical frontier toward the U.S./Mexican border,3 now sets the scene for the raids and house-to-house fighting we know from countless media reports of the war on terror, including the prominent images of digital surveillance featured in war thrillers like Green Zone, Body of Lies, or Zero Dark Thirty. As this iconography already corresponds to the visual register of the police procedural, which is by definition cartographically structured (the “manhunt” motif is central to the genre’s narrative), the new drug war film, in another alteration, combines the traits of three profoundly territorial genres: the western, the war film, and the procedural drama. These three types negotiate what is also the drug war film’s main theme on a spatial level: the limits of control; both recent war films and drug war films emphasize land or cityscapes in their depictions of fighting for and in certain territories. More precisely, these genres share a common trait in the portrayal of opposing communities and their respective dominions, which results in a categorical division of cinematic spaces into “good” and “evil” territories, or into “civilized” and “barbaric” countries. A balance of power is not a narrative option in these films, as their plots are always driven by the desire to appropriate what is under control of the absolute “other.” This classification, however, is not always as clear-cut as it seems. Classical Hollywood war films of the 1940s have already frequently contrasted the generals’ “view from above” with the perspective of the foot soldier: while the aerial shots of enemy territories, as well as the numerous maps featured in genre-typical briefing scenes not only provide a spatial overview but also evoke a feeling of security and control. The films’ battle sequences demonstrate the disorientation and fear the soldiers actually go through. The horror of war and the sensuous experience of combat expose the initial overview as illusionary. By contrast, in most films about the Vietnam War any sense or image of overview is missing completely, which is due to the fact that the war itself lacked clear enemy lines and objectives. And with the extensive televisual and digital mapping of the Gulf Wars – wars led at a distance through the use of missiles and drones – the spatial discrepancy between (and the simultaneity of) the strategic planning and the execution of military operations increased. One recalls the helmet-cam aesthetic of Brian De Palma’s Redacted (2007), or the unsettling quality of the cell phone video in The Valley of Elah (Paul Haggis, 2007). But while Stewart’s main concern is about the subjugation of narrative agency to the aesthetics of technology, there is a complex sensuous dimension to what he calls “digital fatigue,” a dimension that exceeds the optical sensorium: contrary to Stewart, Patricia Pisters, for instance, speaks about the “logistics of perception 2.0” of modern war films and the highly affective character of the digital imagery they contain. Building on this conception, and moving beyond the genre’s iconography, one could go so far as to say that the aesthetics of surveillance and digital technology have become a crucial element of the war film’s poetics of affect. The appearance of the helmet-cam aesthetic in the police procedural drama End of Watch, however, explicitly points to an overlap between law enforcement and military tactics, evidenced by actual joint training between the Los Angeles Police Department and the U.S. military (Lopez 2012) and a critical interrogation of a policing mentality that Radley Balko calls “the warrior cop.”4 Sicario expands on this overlap, foregrounding the role that remote targeting technology plays in war cinema, responding to war cinema’s mapping impulse, and cinematic citation of Kathryn Bigelow’s The Hurt Locker and Zero Dark Thirty. Consider two sequences that exemplify Villeneuve’s use of these three elements to revise and provide commentary on both U.S. border conflicts and drug war films: the first sequence is an incursion into Juárez that concludes the film’s first act, and the second is a night mission into a tunnel on the Arizona/Mexican border, relying on night-vision-camera aesthetics and aerial targeting that recalls Bigelow’s Bin Laden compound raid. “I’m not a soldier. This is not what I do,” Kate yells in fury to her superior Matt Graver after a cross-border prisoner rendition mission that almost cost her life. Hours earlier, she crossed from El Paso into Juárez in a convoy of DEA SUVs, accompanied by La Policia Federal, on a mission to extract Guillermo (Edgar Arreola), the brother of cartel chieftain Manuel Diaz (Bernardo Saracino), from Ceresco prison to a U.S. military compound in Texas. From the car window – in a sequence that effectively blends elements from prior police procedurals, contemporary war films, and even glimpses of the haunting imagery from Apocalypse Now – she bears witness to the war’s destruction through a series of close shots on her shell-shocked face and images of a city plunged into chaos: dilapidated city parks where older men play squash ball against graffiti-decorated walls while young men sit on discarded furniture; naked, decapitated bodies hang from freeway overpasses, recalling similar images from Miss Bala and Coppola’s Vietnam film, accompanied by a sign proclaiming “they got what they deserve … We are watching.”5 (fig.3); the sound of gunfire a few blocks away brings the convoy to a halt, and La Policia, accompanying the convoy in Ford pickup trucks with mounted machine guns, divert them to an alternate route. These shots are punctured by aerial shots of the city from a helicopter, either looking straight down upon the barrios and the convoy (like drone footage) or a view from the side of a chopper that pulls back to reveal a massive city choking the desert landscape. The audio over the scene blends muted helicopter rotors with street noises and a score from Jóhann Jóhannsson that features manipulated, metallic sound effects that recall the work of Wendy Carlos or the third-act score to Full Metal Jacket. The result is a montage of familiar drug war film landscapes (Traffic and The Counselor), War on Terror surveillance framing (Syriana and The Kingdom), and a disorientation fueled by war trauma (The Hurt Locker and Apocalypse Now). As the convoy returns to the U.S. with Guillermo, his head covered by a black hood like that of a Guantanamo detainee, a traffic jam on the Bridge of the Americas places Kate and her comrades in a perilous position. The contemporary war trope of “random checkpoint suicides” that Garrett Stewart speaks of appears here as an ambush on the convoy by cartel henchmen, quickly thwarted by Matt, Alejandro, and the rest of the team’s familiarity with the tactics and psychology of los traficantes. 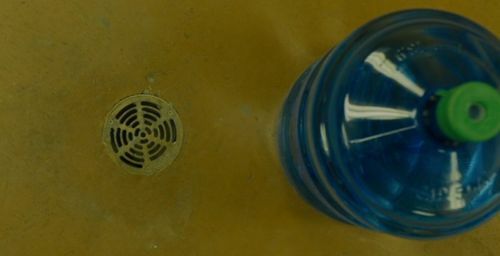 Tapping into the viewer’s expectations from similar paranoid scenes from Iraq War films, the sequence features striking similarities to a montage of competing perspectives found in The Hurt Locker. As Macer, Alejandro, and Matt wait for the traffic jam to clear (and nervously anticipate an assault on their vehicles), the bridge is presented as a battle zone through a 360-degree view from a series of identifiable and unidentifiable spectators. The perspective moves from inside Macer’s SUV to a car with dog barking outside the window, into the assailant’s vehicles, to a high-angle crane shot of souvenir sellers walking between vehicles (potential civilian casualties to be avoided), and to an aerial helicopter shot of the agents moving into combat positions once the assassins attempt to exit their vehicles. Just as Bigelow’s film dispenses with the traditional panoramic vision of battle, so too does this moment in Sicario. As the two forces confront one another, Alejandro attempts to verbally disarm the cartel members (“No! No! No! In peace! In peace!”). When this fails, the attackers are dispatched quickly with precision and emotional detachment, recalling the tactics in war film search-and-destroy missions. The sequence ends with Kate inches away from being shot by a rogue Juárez police officer who snuck up from behind the convoy. In this moment, the film’s connection with the war film is compounded through an encounter with self-endangerment and risk, which Michele Aaron credits as central to the story of the moving image (Aaron 2014, 34). After returning to base, Guillermo is led away to be interrogated, in a scene whose low angles and torture undertones recall Zero Dark Thirty (fig. 4). Kate remains outside to confront Matt for taking her from the world of domestic policing into a war zone. “You want to start a war,” she asks. Matt responds: “This is the future, Kate. Juárez is what happens when they dig in.” By the same token, a montage of competing perspectives and genre hybridity, as evidenced by this sequence, is also what happens when “they dig in”; Villeneuve explicitly blurs the lines between police procedural and contemporary war film, as it is the logical conclusion of a search for an audiovisual language to cinematically render a conflict whose combat zones resemble the streets of Baghdad more than the familiar 1980s drug gang turf. Juárez is more than just a city but also what Stephen Graham characterizes as the contemporary warfare and military mindset, one in which there is no “battlefield” but a “battlespace”: “mobilization is … no longer focused within a delimited geographical or temporal space…. [but rather it is] increasingly unbounded in time and space” (Graham, 2011, 3). This point is driven home in a scene from later that evening when another field agent takes Kate onto the roof, asking her if she likes fireworks. Through a binoculars, Kate scans the Juárez city horizon, seeing explosions, gunfire, and the lights of police vehicles responding, all of which is taking place while, in the building beneath her feet, Guillermo is tortured for information: low-angle tracking shots and the use of waterboarding, familiar to viewers in Zero Dark Thirty, and yellow-tinged frames that recall the Mexican sequences from Traffic blend seamlessly to offer a cinematic critique of the drug war and drug war genre. Fig. 4. Guillermo is waterboarded off-screen, an explicit connection between global war and war in America’s backyard. Contemporary war films embark on the idea that the rupture of spaces of sound and vision arising from technological perception not only represents violence but produces violence itself. They not only emphasize the problems of seeing and not being seen on the part of both the observer and the observed; they foreground how technology both enhances our perception and destabilizes our sensory equilibrium in only demanding the attention of singular senses and neglecting others. This, in turn, often correlates with the factor that films dominated by technological aesthetics seem to deprive the spectator of their perceptual agency in blurring the lines between different cinematic simulacra – between digital images and images of digital images. Paranoia thus occurs when an image supposedly representing a certain character’s point of view turns out to be a machinic, or even completely disembodied gaze – something Slavoj Žižek calls an “impossible subjectivity” (Žižek 2001: 36). In suturing together embodied and disembodied perspectives or spaces, contemporary films about armed conflict, including the Mexican theater of the U.S.-led drug war as exemplified by Sicario, at the same time mobilize and paralyze the spectator in their sensory aesthetic experience. In a more general sense, cinematic paranoia influences our aesthetic experience in such a way that it tends to undermine seemingly inconspicuous spatial structures or surfaces. 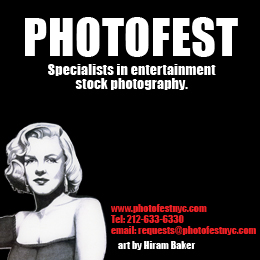 It originates in a film’s juxtaposition of spatial layers of familiar, quotidian life and unexpected flashpoints of violence – an affective experience that is communicated to the spectator by means of image composition, cinematography, and editing. The interplay of disjunctive images and sounds ultimately challenges the cognitive map (the textual coordinates and connections) a film provides. 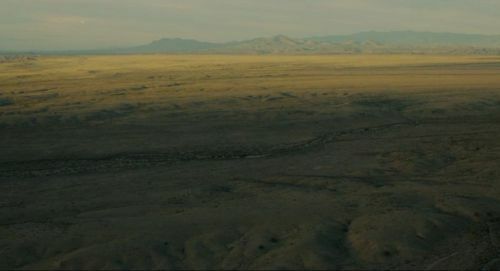 Sicario clearly refers to the paranoid aesthetics of contemporary war films in two ways: first, by implementing their strategies of cinematic mapping and constructing (in)visibilities; second, by embedding said strategies into a dramatic frame in which the limits of power become manifest as a conflict between personal and institutional interests. An early scene of the film, for example, epitomizes the opacity of police action precisely through its seemingly transparent mise-en-scène: While Macer and her colleague are waiting to be interrogated by the FBI’s executive board about the Arizona incident, the board members can clearly be seen behind them as the conference room is enclosed by glass walls. Yet Macer is unable to hear what is literally discussed behind her back, although she sees the men looking at her through the glass. This discomforting separation of sound spaces within a single visual field underlines the deficiency of visual “transparency” proposed by the film and helps to deconstruct the phantasm of optical control that pervades modern warfare and technophilia as such. This being but one example, what is supposed to demarcate a “hygienic” and virtuous principle of counterinsurgency in Sicario is always disturbed by some kind of disruptive materiality: The occasional focus on dust particles made visible by natural light or projector beams, the ample shadow of a military instructor blocking the view of a satellite map of Ciudad Juárez, or the tiny shadow of a plane flying over the hills of New Mexico – all these suggest a disproportionate relationship between dubious measures of law enforcement and transgressive criminal landscapes defying control. Throughout the film, signs of power are hereby rendered as ghostly remains of a former ideal of omnipotence, most effectively symbolized by the array of unmanned helicopters and military vehicles on an El Paso airfield. The numerous choppers and tanks recall the choreographed ballet of army and air force vessels in Ray Kellogg and John Wayne’s reactionary Vietnam film, The Green Berets (1968), as much as they call to mind the infinite field of outsourced American fighter planes in the final sequence of Werner Herzog’s 1997 documentary Little Dieter Needs to Fly. But while the mentioned films point to the (once) idealized mobility of U.S. military forces in one way or the other, Sicario dismantles said ideal to images of powerlessness and ultimate immobility. It is this sense of paralysis that is not only realized in the film’s movement schemata, but which is acted out on and through the female body, that is, through the character of Macer. Very similar to Bigelow’s Zero Dark Thirty, the female protagonist becomes both an agent and a witness of violence. While Zero Dark Thirty’s Maya takes the position of a bold and supposedly influential strategic figure caught up in (and succumbed to) unalterable processes of trade bureaucracy and political terror, Macer sets out as an executive vector of justice only to gradually become a vulnerable object of both male and technological scrutiny herself. Fig. 5 Kate Macer seen through night-vision goggles, the drug war film infused with the new logistics of perception in contemporary war cinema (e.g., Zero Dark Thirty). Macer is also framed against the Sonoran desert landscape, an American frontier reimagined through night vision and subtly emphasizing the film’s mapping impulse. Quite a few scenes in Sicario feature images of surveillance devices, night-vision goggles, or infrared cameras, each of them occasionally focalizing Macer as the object of a disembodied gaze. More than a reference to typical horror conventions, these twists in perspectives also represent the paranoid traits of contemporary war films and thrillers that visualize the tightrope walk between technophilia and technophobia in connection to modern warfare. 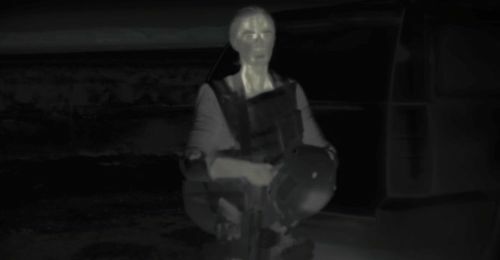 Especially one of the film’s last major sequences, a scene set in metaphorical twilight where a special forces unit led by Graver (and involving Macer) has to search a drug tunnel under the Mexican border, frequently alternates between shots of various digital aesthetics: Cutting from the fluorescent green of night vision to the artificial black-and-white contrast of computer-generated thermal images, the point of view also shifts to infrared aerial shots supposedly taken by drones (and again more likely recreated on a computer). Not only does this sequence visually recall Zero Dark Thirty’s raid of Osama Bin Laden’s compound, and not only does it refer to the ego-shooter mode of war video games in the way it is set in motion, but it also stirs up a profound perceptual insecurity in defiance of the many technological additives it displays. Somewhat paradoxically, the potent optical devices conceal more than they reveal about their environment, whereas the scene’s many amplified sounds of unknown origin intensify the morbid sense of horror that the film has been cultivating all along. Macer is now clearly in the process of losing grip and agency, anxiously moving into the tunnel as a point of no return. Her situation resembles that of FBI student Clarice Starling, heroine of Thomas Harris’ book (and Jonathan Demme’s film) The Silence of the Lambs: Toward the end of the film, Clarice is trapped inside a serial killer’s pitch-black basement, while he is watching her through his night-vision goggles. This predatory gaze articulates the killer’s ultimate monstrosity just before he himself gets killed by Starling. Yet in the case of Sicario, the gaze is hardly associated with a specific character, which renders the monstrous an invisible force simmering under the surface, rather than ascribing it to a definitive enemy figure. Upon entering the tunnel, the image mode switches from night vision to thermographic POV shots. Now, ghostly footprints lead further into the darkness where two men are killed off-screen before the silhouettes of their dead bodies come into view, haunting the screen as surreally artificial objects. A change of perspective: We follow Macer in night-vision mode, continuously drawn deeper into the depth of the image. Finally reaching the tunnel core, which is illuminated by light bulbs, the camera’s point of view, now in “photographic mode,” changes more prevalently, always keeping Macer in focus. However, scenes of shooting and fighting are strictly kept off-screen while we are forced to concentrate on Macer’s anxious – almost shell-shocked – face, her palpable insecurity, her hesitation. In its montage of various technological aesthetics and points of view, the sequence articulates that, no matter which (technological) mode of vision Macer finds herself in, it is never clarifying her situation, let alone enhancing her operation range. Moreover, although she is physically involved in the visceral experience of a drug war, she is always portrayed as a mere pawn of militarized violence – a persistent and oppressive force that is expressed throughout the film on the levels of plot, cinematic space, and sound, as a modulated figuration of affective intensities. The tunnel thus seems to move and work around Macer, willfully obscuring the targets and objectives of her mission, breathing through the pounding beat of Jóhannsson’s soundtrack, and devouring her alive. It is this monstrous quality of cinema that tells without showing and that, through the filter of militarized vision, brings to the surface without ever revealing what is behind this surface – a motor of paranoia that is always “confused with its effects, its supports, its media” (Deleuze 1986: 210). In contrast to Zero Dark Thirty’s Maya, but quite similar to Starling, Macer is always in the line of fire, exposed to and viscerally experiencing a brutality she can hardly process. In this sense, she embodies the perspective of a foot soldier who is put into a battle zone he cannot oversee. This marks another evolutionary step in the audiovisual representation of (drug) war: While the war film as such can be classified as what Linda Williams would call a “body genre,” focusing on combat as a thoroughly sensuous and somatic experience, it is usually the male body standing between invigorating drill and potent weaponry on the one hand, and the agony about his own mortality on the other. Yet the shift to female main characters in films like Zero Dark Thirty and Sicario does not imply a decidedly feminine point of view on institutionalized violence. The heroines of contemporary war films are not, to borrow from the vocabulary of the horror genre, “final girls” that would fight against, and survive, all evil. Nevertheless, they conform to what Carol Clover observes with regard to strong female characters in horror films: They have “very little to do with femaleness and very much to do with phallocentrism,” meaning that they are “girls” only “for purposes of signifying male lack” (53). Within the framework of the war film, the focus on female main characters testifies to the conscious choice not to qualify their respective plots as stories of a male soldier’s emotional commitment to – or turning away from – the military corps. The corps, in this case, has become a corporation operating on its own economic principles. That is, Macer’s limited agency in-between patriarchal hierarchies and her own moral values as a woman simply articulates her successive alienation from the cartel wars’ grotesque rules of the game. Ultimately, this brutal alienation corresponds to the spectator’s simultaneous affective engagement and abstraction from an incomprehensible network of cruelties operating below the surface of seemingly permeable urban worlds. Fig. 6. Kate Macer (above) and Zero Dark Thirty’s Maya (bottom) with the scars of war written on their shell-shocked faces. In Sicario, the police procedural conventions are also rewritten through an engagement with war trauma. Trauma, a discernible narrative device in war cinema, bleeds into genres and corrupts their long-held conventions. There are notable instances of this method of genre revision with the fantasy film (Guillermo del Toro’s El Laberinto del Fauno/Pan’s Labyrinth, 2006), the western (Andrew Dominik’s The Assassination of Jesse James by the Coward Robert Ford, 2007), and the mystery/thriller (Martin Scorsese’s Shutter Island, 2010). Sicario is not the first instance in recent years where war trauma has altered the landscape of the police procedural; Paul Haggis’s In the Valley of Elah (2007) is a detective story whose genre conventions have been corrupted by an Iraq War context and the new logistics of perception in contemporary war cinema. 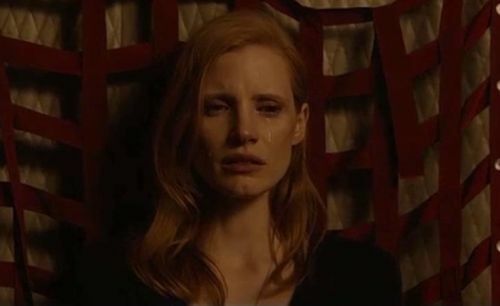 In a scene between Macer and Alejandro after the tunnel raid, the psychological toll of the drug war, and its human cost, is written on her face in a moment that is strikingly similar to Zero Dark Thirty’s ultimate shot (fig. 6). Alejandro surprises Kate at her Tucson motel and asks her to sign a document stating that raid’s tactics and outcome were “by the book.” The conversation begins as a wide shot that moves to a close shot of Macer’s face as she refuses. Alejandro places a gun underneath her chin, she sheds tears, yet she is still unwavering. She finally complies, and as Alejandro leaves, he warns her that she is “in the land of wolves now” and that she will not survive because she is not a wolf. As he leaves, the lingering close shot on Kate is a direct address to the spectator, a visual trope in war cinema commonly known as the “thousand-yard-stare” or what Hermann Kappelhoff describes as the “shell-shocked face”: a hollowness where tragedy is transmitted through the face in an “endlessly condensed micro-episode occurring as affect” (Kappelhoff, 2012, 43). The viewer is invited to take part in a shared suffering by locking eyes with the traumatized veteran, an iconic figure in war photography and cinema whose face elicits feelings of both moral outrage and patriotic remembrance. In a final attempt to restore a sense of justice to this war story, Kate rushes to the balcony and aims her pistol at Alejandro walking away through the parking lot. He turns and issues the same shell-shocked face back at Kate – no words exchanged. Kate finally allows him to leave, knowing that the war is already lost. Aaron, Michele. Death and the Moving Image: Ideology, Iconography, and I. Edinburgh: U of Edinburgh P, 2014. Balko, Radley. Rise of the Warrior Cop: The Militarization of America’s Police Forces. Kindle Edition. 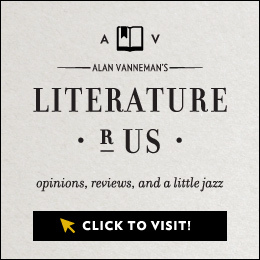 NY: Perseus Books Group, 2013. Clover, Carol. Men, Women, and Chain Saws: Gender in the Modern Horror Film. Princeton: Princeton University Press, 1992. Deleuze, Gilles. Cinema 1: The Movement-Image. Trans. Hugh Tomlinson and Barbara Habberjam. London: The Athlone Press, 1986. Graham, Stephen. “When Life Itself Is War: On the Urbanization of Military and Security Doctrine.” International Journal of Urban and Regional Research, 2011, 10.111: 1468–1488. Kappelhoff, Hermann. “Sense of Community: The Filmic Composition of a Moral Feeling.” In Representations of War: Emotionalizing Strategies in Literature and Audiovisual Media from the 18th to the 21st Century. Edited by Soren R. Fauth, et.al. Translated by the author. Göttingen: Wallstein, 2012: 43–57. Kirkpatrick, Terry. Sixty Miles of Border: An American Lawman Battles Drugs on the Mexican Border. NY: Berkley Books, 2012. Lehmann, Hauke. Affektpoetiken des New Hollywood: Suspense, paranoia und melancholie. Berlin: De Gruyter, 2016. Lopez, Ralph. “Obama Orders Military-Police Department Joint Exercises in Los Angeles, Other Cities.” Daily Kos. January 29, 2012. Melley, Timothy. Empire of Conspiracy: The Culture of Paranoia in Postwar America. Ithaca and London: Cornell University Press, 2000. Pisters, Patricia. “Logistics of Perception 2.0: Multiple Screen Aesthetics in Iraq War Films.” Film Philosophy, Vol. 14, No. 1 (2010): 232–252. Stewart, Garrett. “Digital Fatigue: Imaging War in Recent American Film.” Film Quarterly, Vol. 62, No. 4 (Summer 2009). Žižek, Slavoj. The Fright of Real Tears: Krzysztof Kieślowski between Theory and Post-Theory. London: British Film Institute, 2001. All images are screenshots from Sicario and other films mentioned.